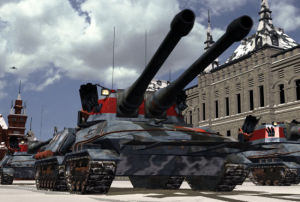 In this article, Command & Conquer’s super-heavy tanks will be examined. Super-heavy is not a strict classification for tanks, this term is used to describe a tank that is deliberately constructed to be much larger than standard tanks. For the purpose of this article, they will be the oversized tanks with more than one main gun. 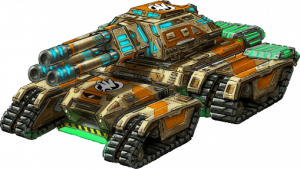 From the first game, super-heavy tanks have been an iconic staple of the series, occupying the top slot for whichever faction represented brute force. From the first game in the series, the famous Mammoth Tank made its presence known by dominating the battlefield with its superior firepower and durability. Two main guns, supplemented with missile racks, allowed it to take on any enemy unit. 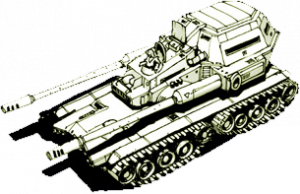 The Soviet Heavy Tanks from the first Red Alert and fully upgraded Marauder in Generals also featured twin barrels, but they are not significantly larger than the normal tanks, so cannot really be called super-heavy. Nevertheless, some of what is examined here might still apply. Putting more than one gun on a tank has always been considered for real tanks, but, with only a few historical exceptions, extra guns are smaller, secondary weapons to supplement the main gun, not another main gun. So why has the double-barreled tank design never really taken a hold in reality? Sadly, the reasons why super-heavy tanks are impractical are numerous, and so it is unlikely the world will ever see an operational Mammoth Tank thundering through a real battlefield. World War II saw the most impressive super-heavy tank designs and also served as the period where the bigger-is-better doctrine for gun platforms effectively came to an end. Not only did the super-heavy tanks no longer receive any consideration, this was also the end of the battleship era for many of the same reasons. Perhaps the most obvious obstacle to fielding a real Mammoth Tank is the cost. Main battle tanks are already expensive enough, but super-heavy tanks also come with a super-heavy price tag. The materials used for their construction are another consideration in addition to money, as larger tanks require more resources to build them. Not only is this a bigger draw on raw materials like steel, it also requires more factory space. In Command & Conquer, if your Mammoths are slowing down your production too much, you can just build more factories, but this is far less simple in the real world. The material and factory requirements are far too high for the manufacture of super-heavy tanks, and this was a major issue of conflict among high-ranking officials for most real-world examples, and generally resulted in the projects’ cancellations. Unfortunately, cost alone is not the only problem. The next problem to examine is the weight, which the very label of “super-heavy” already starts painting a pretty clear picture of what these tanks represent. Weight is one of the most important factors to consider in tank design, because it determines what type of engines need to drive it, what kinds of terrain it can move over, how it will be transported to the front, or if it can cross bridges. Super-heavy tanks typically can never get powerful enough engines, destroy any terrain they drive over, are extremely difficult to transport, and need to ford rivers since bridges can’t support them. All of these problems limit the mobility of super-heavy tanks. A tank’s tracks distribute the weight of the vehicle over a wider area, for a super-heavy tank, more surface area touching the ground can help distribute the weight. The total weight will remain unchanged, so it likely will still not enable the tank to cross most bridges, but it could prevent the tank from ripping up the ground under it, allowing it to turn more easily. 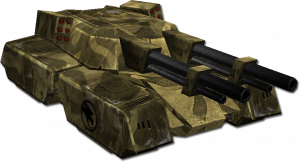 Many of the super-heavy tanks in Command & Conquer have multiple sets of tracks, but with the exception of the Tiberium Wars Mammoth and (surprisingly) the MARV, the surface area of the tracks touching the ground is far too small. Larger tracks will probably demand a larger engine, however; something that is already an issue. One advantage of having an oversized tank is that it can hold an oversized power source, like a nuclear reactor. Nuclear cores can actually be scaled down to a very small size, small enough that a person could hold it in their arms. Of course, such a person would die, because reactors also need radiation shielding, which does not scale down very well at all, requiring a lot of space and adding a lot of weight. Fortunately for super-heavy tanks, weight and size are already excessive and they should be capable of carrying a functional nuclear reactor. And the Nuclear Tanks upgrade in Zero Hour indicates that at least some of the tanks in the series did in fact utilize them. Their one advantage will be short-lived, as size is another extremely important factor in tank design. The enormous profile and heat generated from the huge engines needed to power the behemoths would make detecting the presence of a super-heavy tank on the battlefield laughably simple, so they must rely on their ability to withstand attacks rather than to avoid them entirely. Indeed, the Stealth Tanks of Nod are probably the more realistic future of tank combat than the Mammoth. The next problem to address is not one of numbers, but tactics, tactics that can even be seen while playing the games. Powerful units become high priority targets. Putting a lot of firepower into one easy to spot, slow moving package is a good way to attract a lot of counter-firepower concentrated into that one package. If super-heavy tanks were cheap to build, this would make them excellent decoys, but as covered above, they are prohibitively expensive. Most of the super-heavy tanks in the series try to compensate with anti-aircraft, which is not entirely unrealistic, at least against helicopters, but the missile racks or Gatling cannons would never be effective at stopping ordinance dropped from a fixed-wing aircraft. Ultimately what everything boils down to is this; it is far more cost effective to put two guns onto two vehicles instead. Two vehicles have far more mobility, they can fire at different targets simultaneously, they are easier to power, easier to transport, easier to hide, are lower priority targets, and must be destroyed independently. Two destroyers are more efficient than one battleship, and two main battle tanks are more efficient than one super-heavy tank. There remains one aspect in which a Mammoth will always be superior over any single-barreled tank, it will always look cooler.